Deletion of the liver Irs2 gene. (A) Irs1 and Irs2 mRNA from WT or LKO livers was analyzed by RT-PCR using gene-specific primers. (B) Irs1 and Irs2 proteins in liver extracts (1 mg) from WT, fIrs2, and LKO mice were identified by immunoblotting with specific antibodies. (C) Identification of Irs1 and Irs2 mRNA in the LKO::Irs1–/–, Irs1–/–, LKO, and fIrs2 liver extracts by RT-PCR. 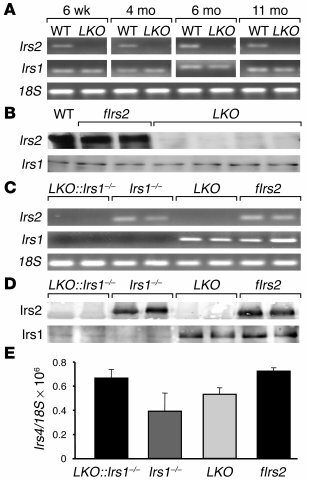 (D) Irs1 and Irs2 proteins in liver extracts (1 mg) from LKO::Irs1–/–, Irs1–/–, LKO, and fIrs2 mice were identified by immunoblotting with specific antibodies. (E) Irs4 mRNA in the livers of LKO::Irs1–/–, Irs1–/–, LKO, and fIrs2 mice was analyzed by real-time PCR. The mean ± SEM of normalized data is plotted.